Fix Your Drink cards are now available for purchase! Use the form below to place your order for a single set of cards and carrying case. Your transaction will be completed through PayPal; you don’t need an account with them, and you can use any major credit card to complete your transaction. Fix Your Drink sets include 20 cocktail recipe cards, a sleek metal slide-top carrying case, and cost $12.95 (plus $2.25 shipping/handling to U.S. addresses only). They are delivered by First Class USPS mail. 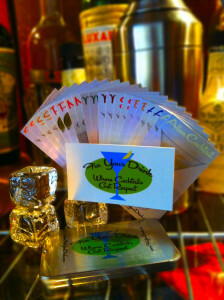 If you’d like to order Fix Your Drink card sets in quantity, please contact us and we’ll work it out. The Top 10 Classic Cocktail collection contains 20 recipe cards, 2 for each of these: Allen Cocktail, Aviation, Bronx Cocktail, Jasmine, Martinez, Moscow Mule, Negroni, Pegu Club, Sidecar, and The Three Miller. It's great if you're just starting your cocktail adventure. The Your Favorite collection gives you 20 cards with the recipe of your select cocktail. If you've decided you really like Negronis (or Aviations, or Jasmines), this is for you. Stay tuned to our Facebook page for news on upcoming FYD special events and new collections. Thanks for your interest!